This will just be a nice catch-all for any question pertaining to the second printing, just so stuff doesn't get lost in the first printing questions thread which is like 20 pages long. So, if you have any questions that relate to the second printing of Fallout: Equestria, post them below and we'll try our best to answer them all as they come in. I just posted in the old thread, so I'll just copy and paste that here! Thanks for doing this, your hard work is really paying off! The books look great. EvergreenDream wrote: I just posted in the old thread, so I'll just copy and paste that here! Yeah, saw you post in the other thread. I tried to move it, but it kept derping on me. Anyway, right now we are working on printing two books. Any plans for potential future printings will not be made until after we finish this one. If you look around the forums, I know there are people who have printed very nice paperback books, but I can't really help you out with that. As for the chapter art, I only can say that right now, we are not including chapter artwork, however, we do have an artist working on new chapter art. Depending on how much time we have and whatnot, there is a chance we will include it, but for the sake of ordering, don't count on it. Hey, I will be on holiday May 9th, and whilst it's not anywhere desolate (London), it's possible that I may have troubles finding steady internet connections, and I realise the payments are supposed to be made on that same day. Would there be any way to make the payment early, simply to avoid any on-the-day hassles, issues, and worries? Thanks. OddballMarko wrote: Hey, I will be on holiday May 9th, and whilst it's not anywhere desolate (London), it's possible that I may have troubles finding steady internet connections, and I realise the payments are supposed to be made on that same day. Would there be any way to make the payment early, simply to avoid any on-the-day hassles, issues, and worries? Thanks. Sent us an email at foeprintproject@gmail.com. We should be able to work something out. Will the books include dust jackets? If no, will you provide official ones for us to print? I'm assuming the old ones won't work with the second printing. jardex22 wrote: Will the books include dust jackets? If no, will you provide official ones for us to print? I'm assuming the old ones won't work with the second printing. We are still in talks about dust jackets. But no, the old ones will not work as we have two books instead of five. 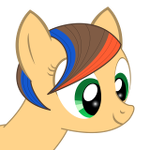 Please checkout my Tumblr, featured on EQD! While I'm at it, are you planning to help publish any non-FOE related books? I know someone who mentioned they were planning on a published version of their story. jardex22 wrote: While I'm at it, are you planning to help publish any non-FOE related books? I know someone who mentioned they were planning on a published version of their story. We're going to finish this printing before we make any plans for another one. Can you describe or show how the book will look like? what kind of cover and stuff? Will the finished product feature chapter art? it's kinda a blind investment at this point so yeah.